For the Vegan Spinach Dip: In a medium saute pan, over medium-high heat, warm olive oil. Add artichokes and break them up with a wooden spoon, and cook until tender, about 3 minutes. Add garlic, and cook until golden brown and fragrant, about 1 minute. Add spinach and cook until wilted, about 1-2 minutes. Season with salt and pepper, remove from heat, and transfer to a medium bowl to cool. To the spinach mixture, add mayo, cream cheese, sour cream, parmesan, mozzarella, and red chili flakes. Stir to combine and season with salt and pepper. Set aside. To Assemble: Preheat oven to 425ºF. Line a baking sheet with parchment paper and set aside. In a small bowl, add chives and parsley and stir to combine. Set aside. On a lightly floured workspace, lay out a sheet of phyllo dough long ways in front of you and brush with olive oil. Top with a second sheet of phyllo and brush with olive oil. Sprinkle a tablespoon of chive mixture evenly over the top. Top with a third phyllo sheet and brush with olive oil. Cut stacked phyllo sheets into thirds, long-ways. 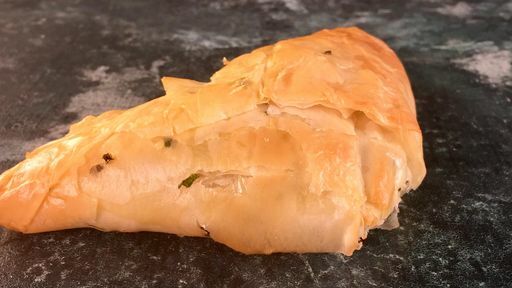 Working with one stacked strip of phyllo at a time, place a tablespoon of prepared dip in the bottom right corner and and begin to roll up like a football, brushing lightly with olive oil between each roll. Repeat until all of the filling is used up. Place the triangles on the prepared baking sheet and brush the tops with olive oil. Transfer to the oven and bake until light golden brown, about 15 minutes. Remove from the oven and allow to cool for 5 minutes before serving. Tip: If wanting to make the classic version of this recipe, just substitute the vegan ingredients for dairy ingredients, keeping the measurements the same.